Summary: The Humane Party has published the fifth full draft of the Abolition Amendment, a proposed amendment to the United States Constitution. Upon ratification, the Abolition Amendment will immediately abolish the property status of all animals under U.S. jurisdiction, thereby ending the dairy, egg, meat, poultry, leather, fur, vivisection, and other exploitation­-based and killing-­based industries. Publication of the final draft of the Abolition Amendment is scheduled for American Abolition Day (December 6) 2016. The Humane Party, a political party in the United States, has published the fifth full draft of the Abolition Amendment, a proposed amendment to the U.S. Constitution. Upon ratification, the Abolition Amendment will immediately abolish the property status of all animals under U.S. jurisdiction, thereby ending the dairy, egg, meat, poultry, leather, fur, vivisection, and other exploitation­-based and killing-­based industries. The current draft of the Abolition Amendment will now be available for comments, criticisms, and editorial suggestions from the public through November 4, 2016. If necessary, the text of the Abolition Amendment will then be revised again in light of comments received and published again for another public­-comment period. 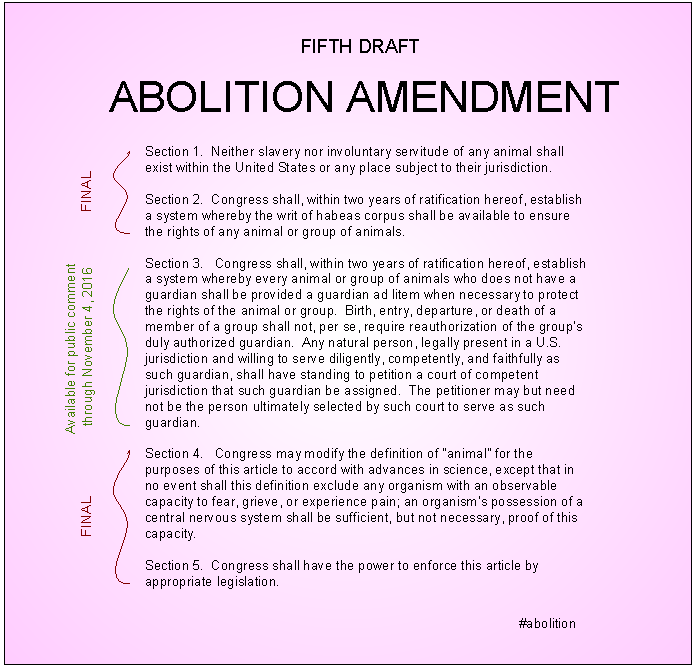 Publication of the final draft of the Abolition Amendment is scheduled for American Abolition Day (December 6) 2016, a national event established by the Humane Party both to celebrate ratification of the 13th Amendment (1865) and to promote ratification of the Abolition Amendment. Comments on the Abolition Amendment may be submitted by way of the Humane Party’s main website (www.humaneparty.org) or its social media page (www.facebook.com/humaneparty). The Humane Party’s announcement comes approximately six weeks after closing of the public-comment period for the fourth draft of the Abolition Amendment. The text of Sections 1, 2, 4, and 5 has now been finalized, leaving only Section 3 still available for public comment, criticism, and editorial suggestion. The present draft provides additional detail pertaining to implementation of the guardian ad litem mechanism for use in asserting an animal’s rights in court.